The "Shanghai Spirit" features mutual trust, mutual benefit, equality, consultation, respect for cultural diversity, and pursuit of common development. 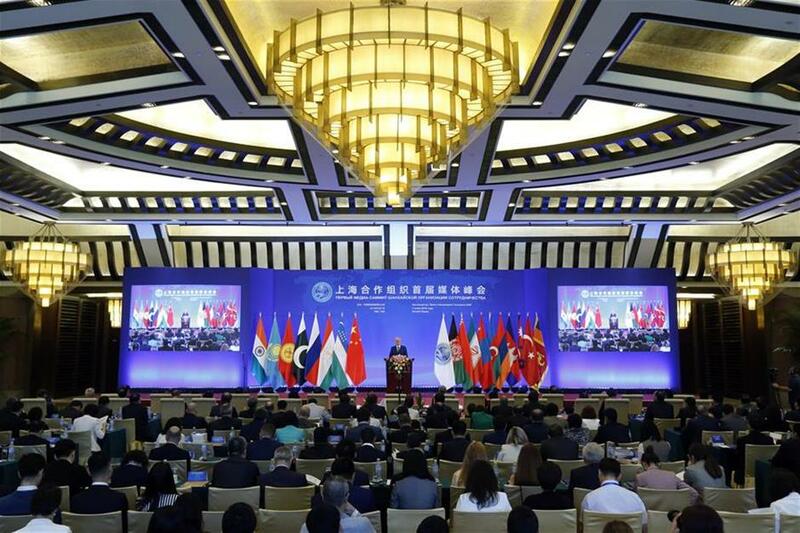 Rashid Alimov, Secretary-General of the Shanghai Cooperation Organization, addresses the opening ceremony of the first SCO media summit in Beijing, capital of China, on June 1, 2018. Officials and media representatives acclaimed that the “Shanghai Spirit” plays a significant role in promoting cooperation among the SCO member states as well as other countries, especially during a time when the world is faced with multiple challenges. They made the acclaim to Xinhuanet on the sidelines of the first Shanghai Cooperation Organization media summit held on Friday in Beijing. Ainura Temirbekova, Deputy Minister of Culture, Information and Tourism of the Kyrgyz Republic, said the pursuit of the “Shanghai Spirit” is not just confined to important statements, but proved by deeds. She said China has made concrete contributions, and the cooperation between SCO countries on the global stage is the only pathway to a shared future. Dmitrii Lukiantsev, Permanent Representative of the Russian Federation to the Secretariat of the SCO, said the organization sets a good example for building a new type of international relations and the “Shanghai Spirit” is of great relevance today. “Combating the three evil forces of terrorism, separatism and extremism is still one of the major tasks of the SCO. While addressing the opening ceremony, SCO Secretary General Rashid Alimov noted that the world is faced with very complicated, continuous and untraditional threats, and he called for joint efforts to build a type of comprehensive, equal, and constructive cooperation. Temirbekova of Kyrgyzstan echoed, saying the “Shanghai Spirit” connects countries together and makes the group stronger when facing such challenges. Priyanka Tikoo, Deputy Executive Editor of Press Trust of India, said the “Shanghai Spirit” is good for countries and the region, especially in today when there are many challenges, as “they can cooperate more in the bilateral programs together and achieve much more”. “Carrying on the 'Shanghai Spirit' and ushering a new era for media cooperation” is the theme of this year’s SCO media summit. Noting that, Temirbekova urged the media to follow the “Shanghai Spirit” to build a community with a shared future for the region. “I think it is very important that media should get together, should create such platform so we can fight the menace of fake news, fight the menace of disunity, and disparity that are growing around us,” he added. The summit is hosted by the Information Office of the State Council of China and attracted over 260 attendees, including officials and representatives of media outlets.